The Maldives Islands are home to some of the world’s best beaches. With stunning white sandy shores, and luxuriously clear waters, many tourists take a Maldives vacation each year. However, these islands aren’t very crowded as the Maldives are comprised of over 1200 islands. That means that the tourist crowds can be rather spread out. The Maldives also offers some of the absolute best snorkeling and diving locations in the world. But, one thing you might not know about the Maldives is that these islands have tiny phytoplankton in the water that glow a beautiful blue color at night. Many say that this magical luminescence is especially prominent in Vadhoo, Maldives. 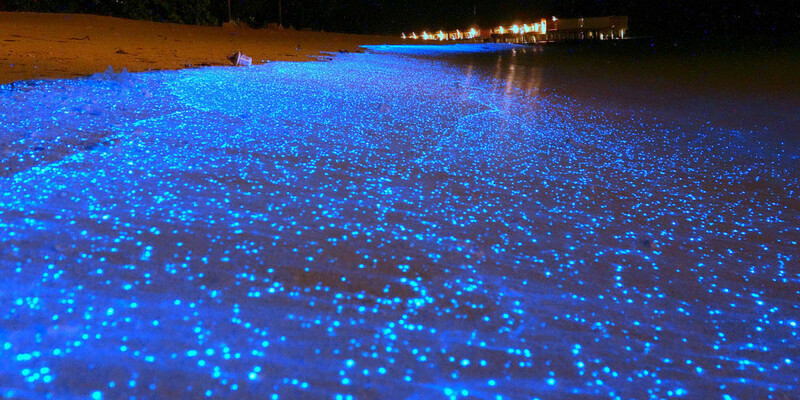 On Vadhoo you’ll see shimmering blue sparkles wash up on the shore that look like the stars above. As you can see, a Maldives vacation is truly magical! Believe it or not, this picture isn’t photoshopped. It’s real! In this beautiful photo from Vadhoo, Maldives, tiny flickers of luminous phytoplankton seem to mirror the stars as they wash up on the shore. Many species of phytoplankton have bioluminescent properties, and can be seen in different beaches around the world. However, Vadhoo, Maldives is well known for its bright blue shimmers. The image above shows an up close view of the luminous phytoplankton. These organisms are in fact very tiny, and yet emit a strong glow that is similar to that of lightening bugs. They actually emit this light when they are distressed, such as when the waves crash onto the shore. Biologists are now beginning to study the phenomenon of bioluminescence and its chemical reaction in more depth. Not only does Vadhoo boast of blue bioluminescent waters, but it also has a surfing spot called Blue Bowls. Blue Bowls in Vadhoo tucked inside a pass between Castaways and Five Islands. Blue Bowls is a great spot for shortboards, but is also mellow enough for longboard surfing, as well.